What Easter hymn was written after the assassination of MLK? 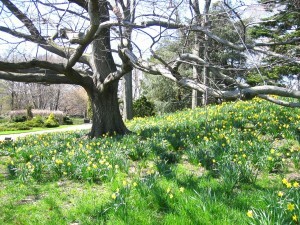 Every spring, I visit Daffodil Hill in the Brooklyn Botanic Garden and recite Wordsworth’s poem for the flowers and magnificent tree. In April, 1968, Brian Wren (British-American hymn-poet, b.1936) needed an Easter hymn to sing just ten days after the assassination of Martin Luther King, Jr. The world still trembled with despair. No one felt like singing. Wren looked through the hymnal but found only lyrics with “triumphal imagery of things long ago, far away, and high above.” The words seemed insufficient to the tragic realities of the moment. Undeterred, Dr. Wren took matters into his own hands and penned the lyrics to a new Easter hymn, CHRIST IS ALIVE. It is a hymn of modern complexity, in which a suffering Jesus continues to be crucified wherever race, class, and war divide us. The good news is that Christ is resurrected in our healing and our hope. Not bound to a cross at old Golgotha nor exiled to a remote heaven in the sky, he is alive where we live, work, and worship today. “Weeping may endure for a night, but joy comes in the morning,” the Psalmist sang thousands of years ago. “Keep your eyes on the prize! Hold on!” the people sang during the Civil Rights Movement in the 20th century. In Brian Wren’s hymn, we are urged to sing, pray, and work for the day when the world will be resurrected from the tombs of injustice, hatred, hunger, and war. We keep our eyes on the prize and dream Easter dreams in a world of perpetual Good Fridays, confident that, one day, all creation will ring with joy, justice, love, and peace. Alleluia! The cross is empty. Christ is alive! Alleluia! ~ [BOOK] Praying Twice: The Music and Words of Congregational Song by Brian Wren, Westminster John Knox Press, Louisville, Kentucky, 2000.